Jan shared this photo of her finished butterflies in the Stitching the Night Away Facebook group recently. She stitched them up as gifts for a weekend family gathering and everyone got to pick one to take home with them! Butterfly Stitched by Lisa H.
I love what Lisa did with the words here, great finish! I love it when Brushstroke Butterfly finishes come in for the gallery, they’re all unique and so much fun to see. This very special butterfly was stitched by 9-year-old Gavin as a square for a World of Charity Stitching quilt project. 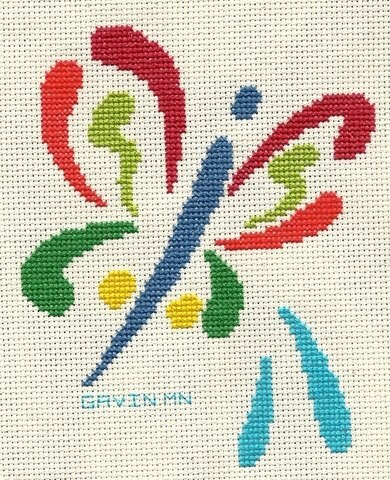 Gavin has been stitching since he was 7 and I’d say he did a very lovely job of it, plus he has great color choices! This butterfly is a free cross stitch pattern available right here on Stitching the Night Away. It’s the perfect size for a charity square or a quick gift. Wilhelmina shared this photo with us on the Facebook page of her finished Brushstroke Butterfly square that she stitched for a group quilt project over at WOCS. Thank you Wilhelmina for sharing your work 🙂 Great color choices, it really feels like Spring just looking at those! It makes me very happy to add this butterfly to the gallery here. I almost cried reading Prithivya’s email when she shared this picture with me and told me that this was her first cross stitch project! I love it when I’m browsing around the needlework community online and I stumble across a Stitching the Night Away design used somewhere. It really makes me day a thousand times brighter, especially when I see them used in charity projects like Cole’s Quilts and Love Quilts! LindaZ posted these on Photobucket and the 123stitch message board this week and they are amazing! Beautiful stitching and quilt finishing by everyone involved! In this one you’ll spy two Brushstroke Butterfly squares…. And in this one you’ll spy the Celtic Dream Knotwork block, which was designed with charity quilt projects in mind…. Thank you Linda for sharing those pictures and for participating in projects like this! Another Butterfly from Maggi S. for Cole’s Quilts! I truly love getting all these pictures in my inbox, so please everyone continue sending them in! This butterfly was stitched by Maggi S. as part of a project for Cole’s Quilts. I love the colors, so much fun! Thank you Maggi for sharing your work with us! Thank you for sharing your work with us, Nicola!